Southeast Asia is a food lover's playground, and no food blog captures the region better than Eating Asia. Robyn Eckhardt and her husband Dave Hagerman have spent the past 4 years hopping around Malaysia, Vietnam, Thailand, and other spots, blogging and freelancing for publications such as The South China Morning Post and Time Out Kuala Kumpur. From banh mi snackdowns to portraits of Penang's cooks and street vendors, Eating Asia's posts reveal a intense passion for both the food and the people behind the food. And the photos will leave anyone starving for more. How did you become interested in blogging about the cuisines of Asia? First came an interest in writing about the cuisines of Asia and, following logically from that, a desire to write well about the cuisines of Asia. I wanted to become a better writer but I needed a prod to practice. The blog gave me a reason to sit down in front of the computer on a regular basis and write (the photographer had a similar impetus to blog). What was your perception of Chinese food before you first visited China? Oh goodness, I grew up in suburban Detroit in the 60s/70s, so you can probably imagine what my perception of Chinese food was! My family often picked up Chinese carryout on Sundays -- egg foo yung (I still don't know exactly what it was), chicken chop suey, fried rice, chicken peanuts, bland and mushy mixed vegetables. In uni (still in Michigan) my roommate introduced me to crab rangoon and my now-husband introduced me to guotie with chili oil, but that's as far as it went. Most Singaporeans I know are about crazy about food, and KianLam Kho is no exception. His blog Red Cook may be just 1 year old, but it has already drawn a number of devotees who hunger for great insight into Chinese home cooking. It's hard not to be seduced by his posts, like this meticulously documented Moon Festival banquet. 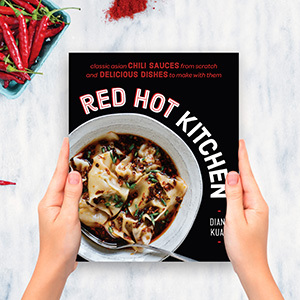 From stock techniques to a recipe for mouth-watering red-cooked pork, Kian is a pro at "sharing the joy and frustration of cooking Chinese food at home." What is your earliest memory of Chinese food? I grew up in Singapore and was exposed early on to many different types of food, including Indonesian, Malay, Indian, Nonya (a local cuisine influenced by Chinese and Malay cooking) and many types of regional Chinese cooking. However, the food served at home was mostly Chinese and heavily influenced by my family's roots in Fujian province. Fujian cooking is generally non-spicy and dominated by seafood. I remember growing up with Fujian-style mustard green rice with dried oyster, red cooked pork (also known as kong bak in Fujian dialect), steamed fish and egg-drop seaweed soup. I also remember our servant making pork floss by slow cooking lean pork in soy sauce and spices over the entire afternoon until the meat disintegrates and dehydrates. We didn't eat Cantonese food at home but would go out to a Cantonese restaurant. What do you think are the major differences between the Chinese food in Singapore and the Chinese food in New York? When I was growing up in Singapore the Chinese food available there was mostly confined to the immigrants' regional cuisines. Namely Canton, Fujian, Hainan, Hakka and ChiuChow cooking. When I first arrived in the U.S. in the mid 1970's Chinese food in America was predominantly Cantonese cooking. So I thought then the choice of cuisine was rather limited. The variety was further restricted by the scarcity of authentic ingredients, which made it very difficult to create authentic food. I would go to Cantonese restaurants in Chinatown for simple noodles and dim sum dishes because those were the ones that could be reproduced quite faithfully. Today there is still a wide gap between ingredients available in New York City and those in Singapore. Althoug sometime I can find very rare ingredients in New York they are often only available in specialty shops and sporadically. On the other hand Singapore has expanded the import of ingredients and culinary talent from China over that last decades, making it one of the most vibrant cities to sample Chinese food. What do you consider "comfort food", and where would you go if you craved it? I consider a steaming bowl of noodle soup or porridge as my comfort food; especially porridge. Porridge is to me what chicken soup is to most Americans. I still make a hot steaming bowl of porridge whenever I'm sick. I like the Fujian-style porridge rather than the Cantonese-style. Fujian style retains whole grains of rice whereas Cantonese style is cooked until the rice becomes mush. We would eat the porridge with pickles, pork floss, and salted eggs. That is what I'd call comfort food, and best made at home. Where do you get the ideas for recipes and other blog posts for Red Cook? My most creative recipes usually result from experimentation in my kitchen inspired by my dining experiences when traveling. I also get ideas from reading cookbooks and doing online research. In addition I often consult my culinary professional friends. Online research has also become an increasingly important part of my recipe development. There is much excellent cooking information available out there in English and Chinese on blogs and cooking Web sites. For blog posts I draw inspirations from my childhood memories, travels, and current events. Mastering The Art of French Cooking - "Mastering" is my favorite cookbook that is technical without being a text book. Julia is excellent with describing techniques so a home cook can understand. I learned most of my basic cooking techniques from this book, before I ventured into more technical ones such as the CIA's "The Professional Chef." The James Beard Cookbook - This book introduced me to American cooking and taught me how to make apple pie and Yankee Pot Roast. I love his incidental explanations of ingredients and cooking variations in addition to the simple instructions. His recipes always remind me that delicious food can be produced without a complex cooking process. The Complete Chinese Cookbook, edited by Ye RongHua (中國名菜大全, 葉榮華) - This is a Chinese language cookbook published in Hong Kong in the early 1970's. There is a second volume devoted entirely to dim sum cookery. 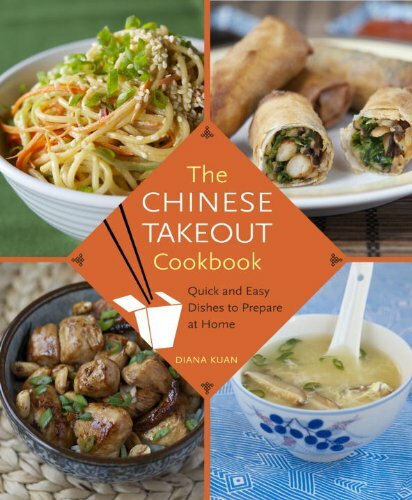 It is from this book that I learned proper Chinese cooking techniques. I was also exposed to many regional Chinese dishes even before I had the opportunity to sample them. Three pantry items you can't live without? Garlic, garlic and garlic. Ok, maybe rosemary and soy sauce as well. I adore garlic and since I mostly make Chinese, Italian and Mediterranean cooking, garlic is always a required ingredient. Imagine you had $10,000 and 1 month at your disposal for a self-planned culinary tour. Where would you go and what would you eat? You know $10,000 can't really buy a grand culinary tour anymore. If I didn't have to worry about expenses I think I'd go to Guangzhou and Chengdu to seek out undiscovered provincial as well as formal cooking of Guangdong and Sichuan. I'd travel through small villages to sample local dishes and enjoy the unique indigenous flavors. These two cuisines are diametrically opposed in flavors and taste yet similar in cooking techniques, which fascinates me. I'd end my travel in Hong Kong where Guangdong cuisine reaches its height of sophistication.